The courtyard around the Louvre Museum’s famed glass pyramid is to become the stage for a giant interactive performance orchestrated by French visual artist JR as part of celebrations for the structure’s 30th anniversary. An army of volunteers started pasting a colossal 160,000 square feet paper image over the courtyard to prepare for the trompe l’oeil. The image will create the illusion of a larger pyramid emerging from rocks as if it had been discovered by an archaeological excavation. The 70-foot-high glass-and-steel pyramid, designed by Chinese-American architect I.M. Pei, now aged 101, was controversial when it was inaugurated in the classical setting of the Louvre in March 1989. But has since become a beloved Paris landmark. The new trompe l’oeil will be fully visible from Friday evening only from the museum’s roof. JR’s team has installed two giant screens on the courtyard to allow visitors to see the result from the ground. For two days, Saturday and Sunday, the courtyard will be open for visitors to walk on it and observe the optical illusion. “Once everything is pasted, people will be over the image and it will fade away and disappear,” JR said. The interactive part of the project - volunteers enrolling to paste 32-foot-long paper strips and tourists walking, watching and appearing on the video shot from above - is what attracted the Louvre authorities. “The visitor is always at the heart of our concern, with always the goal to better welcome them,” Louvre president Jean-Luc Martinez said. The performance is a continuation of a giant trompe l’oeil three years ago that made the pyramid disappear behind a giant black-and-white photo. 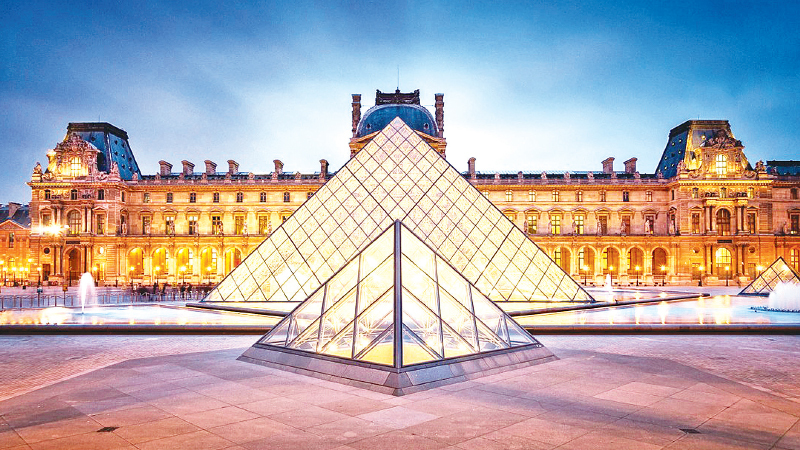 The pyramid is the most popular of a series of ambitious projects launched by then President Francois Mitterrand in the 1980s and 1990s that changed the image of the French capital.